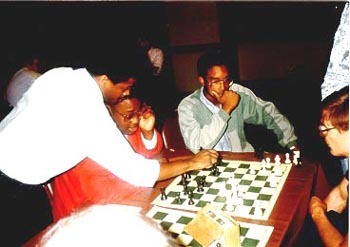 The year of 1989 was an interesting year for Black chess. Maurice Ashley and Emory Tate had begun to get the recognition they had long deserved and had continued to prove themselves. 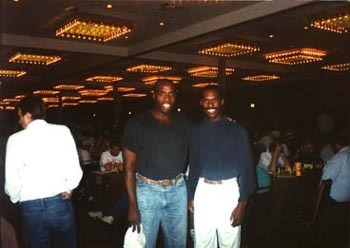 Both starred at the 1988 New York Open earning IM norms. In May 1989, the math genius FM Ron Buckmire had been profiled in the U.S. Chess Life magazine and Ashley would follow in the October issue. Tate was already notorious for his tactical style and had graced the pages of Chess Life for amassing several Armed Forces titles. This tournament was important besides the fact it was held in my hometown of Chicago. 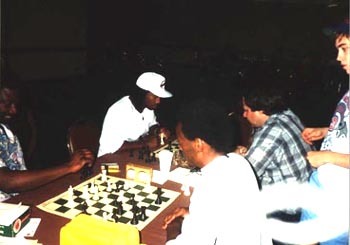 It was the tournament where I met Maurice Ashley and told him about the idea of a network for Black chess players. I remember exactly how I met Maurice. The conversation centered on his t-shirt which simply said, "Jamaica." The next time we met was the next year in New York where I was interning with Sport Illustrated. At this tournament, I also met R.O. Mitchell who in 1990 would become the U.S. Junior Champion. Young Kimani Stancil of Maryland was playing as well as FM Morris Giles and NM George Umezinwa. The pictures below show some of the scenes at the tournament. It also features former teenage stars, legendary chess figures, players who are no longer playing… and some who are no longer living. Hope you enjoy! FM Maurice Ashley analyzing R.O. 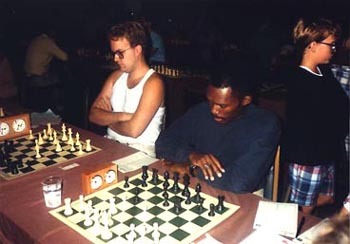 Mitchell's game (with his seated opponent) at the 1989 U.S. Open. Kimani Stancil looks on. R.O. Mitchell came from nowhere to win the U.S. 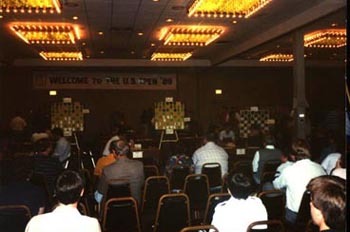 Junior Open in 1990. After winning his Master's title, he disappeared from active play. Stancil, also a young star in this picture, earned his Ph.D. in Physics from MIT in 2002. 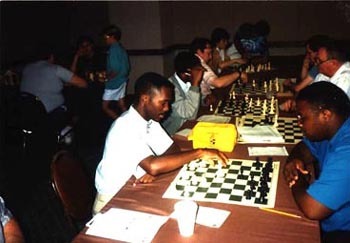 (forefront) George Umezinwa (left) about to play Qa6xc8 against Allen Stewart in a blitz battle while young star Robby Adamson looks on. (background) Wallace Gordon is at the adjacent board playing a West Coast hustler. Pictured in the box are FM Maurice Ashley in t-shirt and Sam Ford (burgundy shirt) peering over the shoulder of FM Emory Tate. 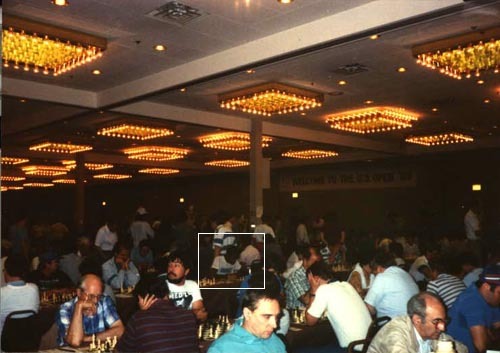 FM Albert Chow has the plaid shirt and GM Arthur Bisguier is playing at near right. 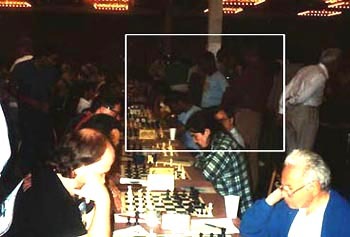 (in box) FM Morris Giles waits on opponent after having played 1.e4. IM Stuart Rachels, once a child prodigy, sits to his left. Also in picture is FM Dr. Eugene Martinovsky (now deceased) adjusting his glasses against NM John Burke and near right is FM Billy Colias (also deceased) who succumbed to cancer at a young age. Here's an exciting game by Giles. Operator punching in move on "BeePee" computer. This represented the earlier days of computers competing in tournaments. I am showing R.O. 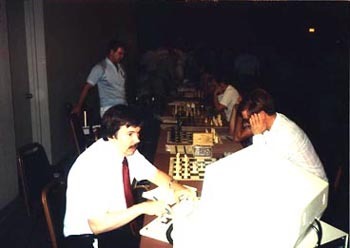 Mitchell my 2nd-round game vs. FM Emory Tate… a wild affair! I'm on the move against Osterlund… I won with a tactical flurry at the end. Check it out! NM Marvin Dandridge and me. Marvin is a good friend and as a rising junior, I tested my skills against his tactical brilliance… received a lot of bruises, but eventually they healed! (in box) FM Maurice Ashley pondering next move in a sea of faces. Here is one of his games from the event. 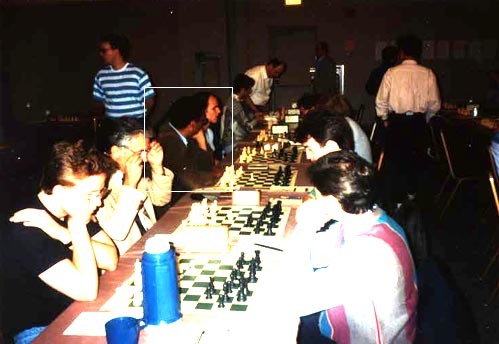 Ashley annotated this game for the October 1989 issue of Chess Life. Copyright © Daaim Shabazz. All rights reserved. The photo content contained on the pages referenced above may not copied or electronically transmitted without the expressed consent of the author.